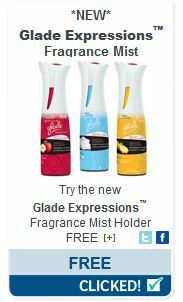 Hurry over to Websaver.ca and order your coupon for a FREE Glade Expressions Fragrance Mist Holder! I already ordered mine. Looking forward to trying it. I love things that make my house smell nice. This entry was posted in free product coupon and tagged free product coupon, websaver on April 23, 2012 by Courtnie.